These were a huge hit at Carroll Cafe. These are everything a chocolate lover needs. 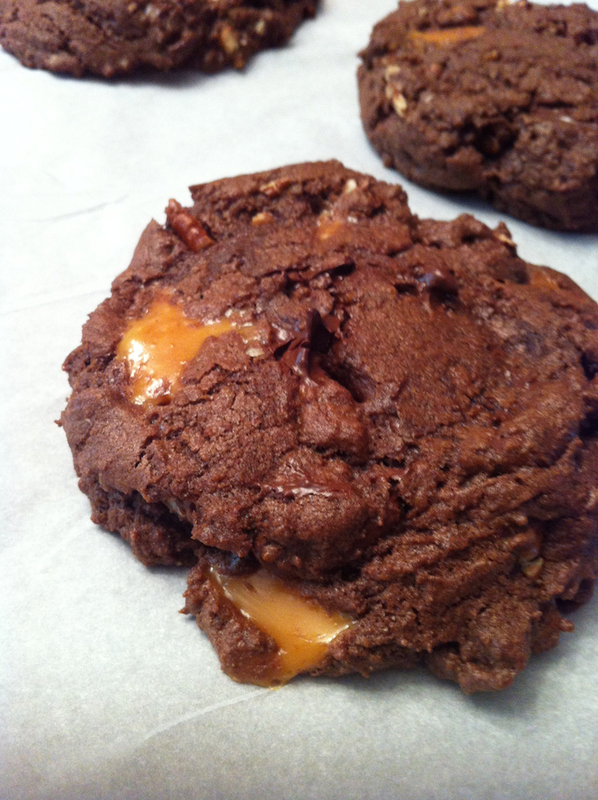 The rich chocolate cookie is almost brownie-like and is stuffed with crunchy pecans and gooey caramel bits. These are an intense treat. Your sweet tooth will definitely be satisfied. In a medium bowl, sift together the flour, baking soda, salt and cocoa. Set aside. In a large bowl, cream butter and sugars together until light and fluffy. Add eggs one at a time, mixing well after each addition. Add vanilla extract and beat well. Gradually add flour mixture and beat until just combined. Stir in chocolate chips, pecans and caramel pieces. Using a 4oz scoop, scoop the batter on to prepared baking sheet and press down on the dough balls to flatten. Bake for about 10-15 minutes or until set. Allow cookies to cool on baking sheet for about 5 minutes.